Sifu Lo began his martial arts training in 1963 studying with such noted masters as Sensei Iguchi, 6th Dan Judo, 5th Dan karate, all-Asian Judo champion, 1961 & 1962; Sensei Kanakogi, 6th Dan judo, 5th Dan karate, All Asian Judo Champion, 1963 & 1964; and Sensei Tadashi Nakamura, 5th Degree black belt in Kyokushinkai karate. In the early 1960's Sifu Lo also studied Shotokan karate under Sensei Nyjack, Tomiki Method Aikido under Sensei Katsu, and Ed Parker's Kempo Kung Fu under Sifu Bob Hirsch. In the mid 1960's, he was the inner door student of Gin Foon Mark, 5th Generation Master of Kwong Sai Jook Lum Praying Mantis, under the legendary Grandmaster Lum San. 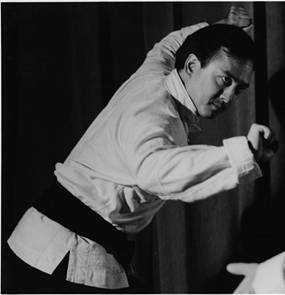 Ken Lo performed demonstrations for Sifu Mark in the Philadelphia and New York Chinatowns, and Columbia University in 1969. A student of Zazen at the New York Zendo in the late 60's, Sifu Lo has studied Meditation, Buddhist philosophy, and Yoga since 1968. In 1970 he trained under Master Jack McCrave, 9th Degree black belt in Vadha, an East Indian martial art. Under Master McCrave, Sifu Lo also studied hypnotherapy. In 1973 he was initiated into Maha Yoga and became the disciple of Swami Shivom Tirth Maharaj, spiritual head of Devatma Shakti Society worldwide. In the same year, Sifu Lo met Grandmaster Hsieh Peng. He became Grandmaster Peng's disciple in 1977, and headed the Wu Mei Kung Fu Association in 1985 when Grandmaster Peng retired from active teaching. Sifu Lo is the founding Director of the Wu Mei Kung Fu Association and is the highest authority of Wu Mei Kung Fu worldwide. Sifu Lo is recognized by the Chinese government as an authentic traditional Chinese Martial arts master. He is also the founding Director of the China Arts Council, whose mission is to preserve and promote traditional Chinese cultural arts in the West. Through the China Arts Council, Sifu Lo has worked with: the Guggenheim Museum, the Prospect Park Alliance, the Chinese Scholar's Garden, the Hammond Museum, the Asian Pacific American Heritage Festival, Families with Children from China, the Eldridge Street Project, and many other cultural institutions. Having taught martial arts since 1969, Sifu Lo's students are ranked among the top three in national competitions across the country. Sifu Lo is an active member of the Chinese martial arts community, and has sat on the Executive Board of the National Council of Chinese Martial Arts, and on the National Internal Styles Rules Committee of the AAU Chinese Martial Arts Division. Sifu Lo has been the National Vice Chairman, Northeast Regional Director and the Metropolitan Association Chinese Martial Arts Chairman of the Amateur Athletic Union. Sifu Lo is a National Advisor to the USA Wu Shu Kung Fu Federation. He is a respected member of the North American Chinese Martial Arts Federation, the Eastern United States Kung Fu Federation, and the Tai Chi Association of New York. In addition to his martial arts studies, Sifu Lo has studied Chinese poetics from Dr. Lo Wai Luk, Ph.D. Sifu Lo has studied Feng Shui (the Art of Placement), Face Reading, Palmistry and Hand Writing Analysis from Master Eng Suern Gwoo since 1990. Since 2000, Sifu Lo has been studying Tibetan Buddhism from Geshe Michael Roach of the Asian Classics Institute. Ken Lo has been studying Chinese calligraphy and Cha Dao (the Art of Tea) from Master Lo Chien Wu since 1994. Since 2007, Sifu Lo has been studying Poker Game Theory and is in training to become an International competitive Poker Champion using Chinese Martial Art principles.